Your Android smartphone is powerful but very dangerous! Apps and websites invite hundreds of 3rd parties to track users like you, steal your data and expose you to potential malicious threats. Your privacy and security can be severly compromised with serious near and long term personal, career and financial consequences. Visualize complete network background activity behind apps in real-time. Behavioral and Predictive analysis to identify and block suspicious or malicious apps. Proactively protects against all phishing malware, ransomware, adware, trojans, and other unwanted background activity behind apps. 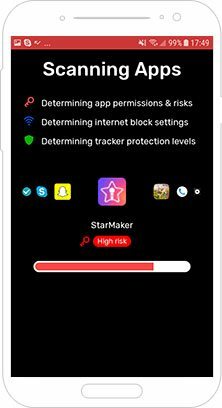 Monitor and block all non-essential incoming and outgoing internet connections behind Apps and websites. View your device and app background network connections and countries they are communicating with. 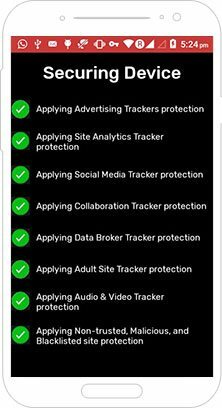 Daily tracker and app definitions updates to ensure the latest protection. 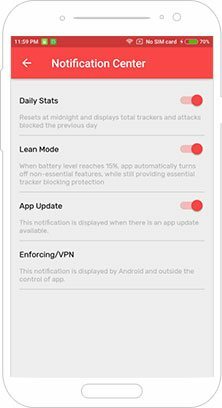 Redmorph offers the only comprehensive solution for your Android Smartphone to get proactive control over both privacy and security issues. 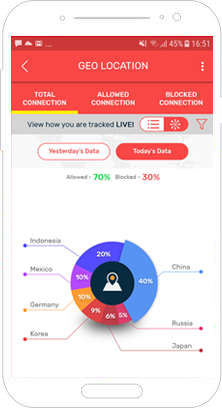 In addition to your 'peace of mind', the blocking of non-essential background activity and network connection results in significant data usage savings and improved device performance in most devices. Please enter your mobile number to receive the download link. We don’t collect your information. We don’t sellout to advertisers or data brokers. We do provide you the most comprehensive and effective online privacy & security protection available. Websites and apps manipulate search results and pricing based on user location, search & browsing history, gender, etc. Here are some recent articles. Companies are creating a "reputation score" based on user's social media and online tracking. This is increasing being used by potential employers, university admissions officers, banks (loans), and insurance companies for screening applicants. User data is the currency of the internet. Large companies called Data Brokers are openly buying and selling intrusive user data from all parties. It has become easier for criminals or unethical foriegn entities to track employees or steal confidential data from their devices. Users can download apps that have trojans that can spy on their banking apps and steal their login/passwords. Recent Trojans such as Svpeng also can auto update their code. Android ransomware can lock a victim’s phone by changing the device’s PIN and encrypts all the data stored in the device. This makes it nearly impossible for victims to access their data without paying a ransom. Once user downloads a malicious apps, it is possible for the app to get access to their mic, location, camera, phone calls, text messages, and files on the device. They can also monitor other apps. This allows hackers to remotely track users. Your Android device can get infected when you download Apps from Google PlayStore or elsewhere containing malware, or when you innocently click on a misleading link in a text message or email. Once downloaded, the Trojans or malware can remain dormant for long periods and then be remotely activated by their authors to then participate in secret and illegal global cyber attacks. 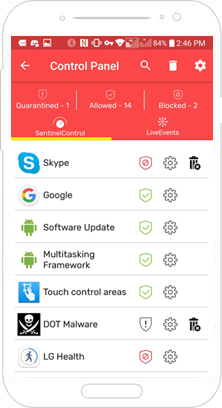 Proactively protects against all phishing malware, ransomware, adware, trojans, and other unwanted background activity behind apps. Secure yourself from apps that trick you into revealing your login credentials or credit card numbers with counterfeit overlays. 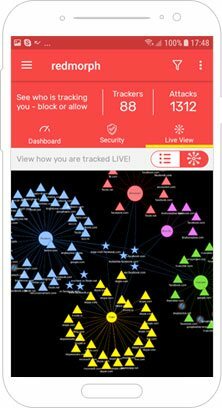 Redmorph's advanced technology monitors the background behavior and intent of all the apps to proactively identify and stop tracking or other malicious activity. When Apps from known or unknown sources (malicious) start spying on other apps, begins interfering with the System functions of other apps. Redmorph's Sentinel System, immediately identifies and kills this activity, quarantines the app and immediately alerts the user. This proactive security feature helps identify new or unknown malware or malicious apps and helps prevent cyber espionage or cyber threat activities. Smartphones you use and Apps that you download may be playing mischief behind your back. See which apps are connecting to the internet and where their servers are located in the world. You can see this in real time and secure your data by blocking or uninstalling such apps.